9 Creative and playful rooms your kids will love! 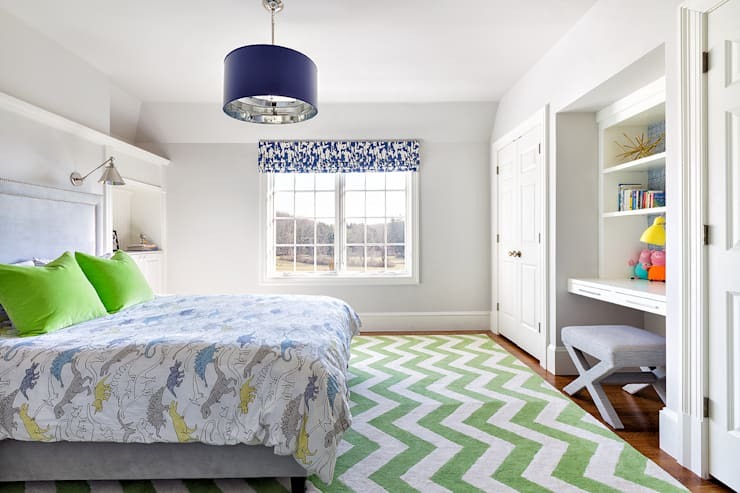 Creative and playful rooms your kids will love! 9 Creative and playful rooms your kids will love! Aztec prints are super trending, and they stand out beautifully when paired with solids, and what better color for a room than white, that makes even the lightest color stand out discreetly. The designers have created a casual seating by the window and a study table facing natural light, perfect for a studying child. Whom do you think this room belongs to.. a girl or a boy? This room is minimalist in appearance, and has a big closet to keep all the stuff to maintain the minimalist look. The combination of green and blue gives a cool appearance to the room. Here is a twin bed room for two boys in the house. Boys love robots, and the upholstery of this room reflects the fact. There is a small table to store all the books and board games and the space on floor in the center is the perfect place to play these games with each other. A great idea indeed! Flowers have always been a favorite of girls, and the designers at Douglas Design Studio have taken advantage of this fact to decorate this room. The motifs on the wall have been carefully matched with the curtain and the upholstery is beautifully matched to create a beautiful and harmonious ambiance, where everything seems to fit together. Pastel blue with bright yellow makes this room look fresh and bright. The use of colors is good for the brain development of a toddler, and this room is the perfect place for raising a bright kid. The round table in white surrounded by colorful chairs looks like a perfect place for a toddler play get together. 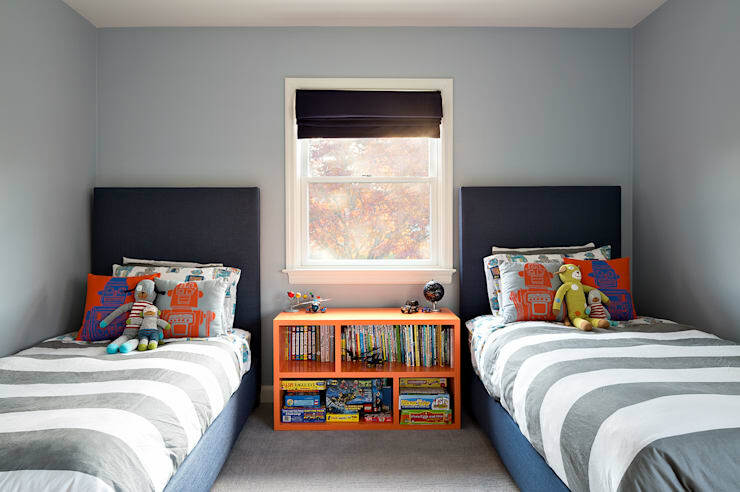 The room is bold and bright, reflecting the personality of a young lad that loves to read and play too. The mezzanine floor in the room takes advantage of the high ceiling and the straight ladder leading up to it ensures, the boy enjoys some alone time too. 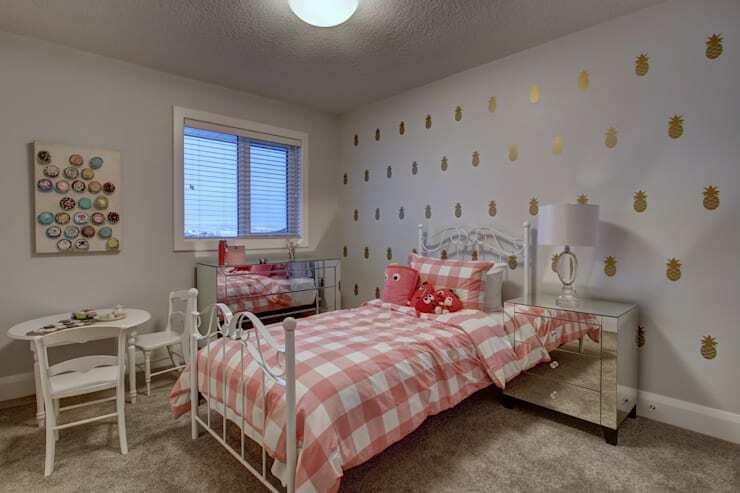 This girls room has a cottage style feel to it, with light color on the wall, and upholstery in a conventional pink for girls, this bedroom is a soothing treat to the eyes. The silver nightstand, dresser and golden pineapples add glamour to the room which has silver and gold and a charm untold. 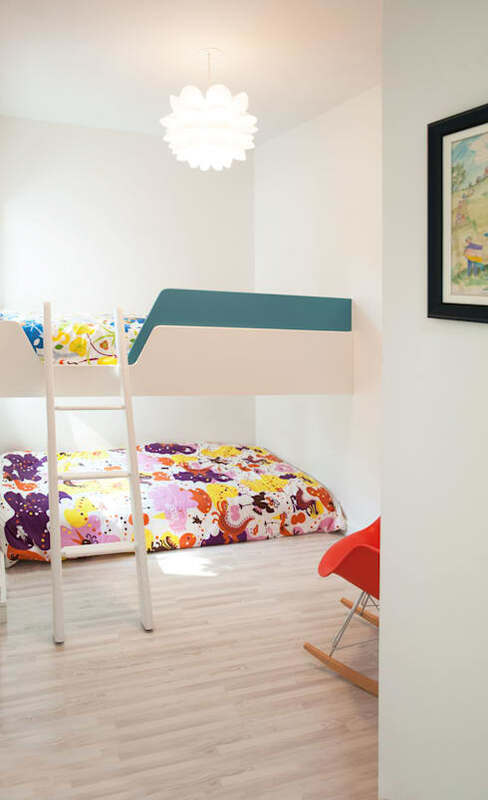 A bunk bed is a great way to create space in a room. It offers storage, it allows double sleeping in very less space and is fun for kids to climb on. 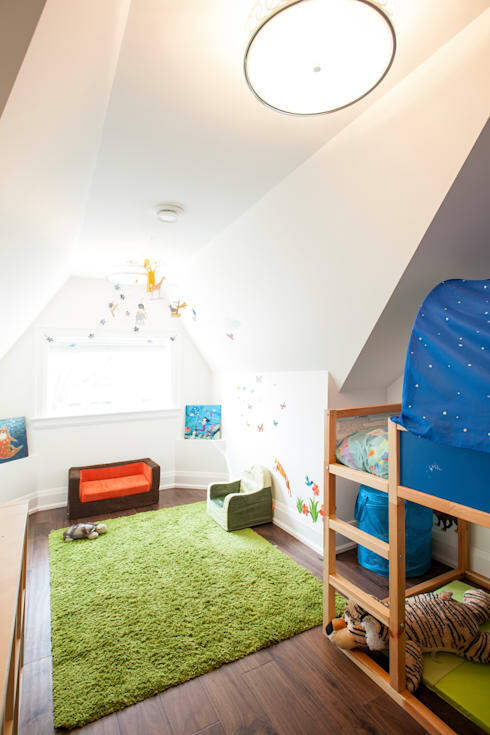 This room in the attic has ample space for the kids to play, thanks to the creative use of bunk bed. The designers at Solares Architecture used small fabric sofas too for the kids to sit and play, and the floor is kept in wood to allow the kids enjoy the floor time as much as they want. This is in true sense what minimalist is all about. A bed fitted on the wall, and a mattress below it has been made to create a bunk bed in a very low cost. A great move by the designers, to keep things simple and minimalist. Hope you liked these unique and simple ideas for the kids room. Let us know which kid's room is your favorite!